The last couple of weeks of my pregnancy with Marjorie I found myself in a state of unrest regarding when she would come. As someone who had never had a baby past 39 weeks and ended up going past term it was a very different experience for me. It was a very good experience for me. Honestly, if the baby had come earlier it would have been likely that my husband wouldn't have been here. The last couple of weeks were sprinkled with little trips - a night away here, a night away there. We had family in from out of town. We had camp for our biggest boy that my husband went to with him. I was fortunate enough to have family and friends at the ready to step in if need be, but it still would have been scary to go into labor without my husband in town. 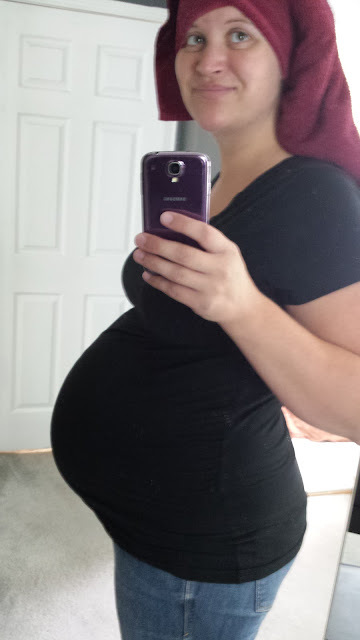 A week before my due date I started getting contractions 4 minutes apart. I lay in bed for over an hour before I shook my husband awake and said we needed to head to the hospital. We called my parents who were picking my my Aunt and Uncle that night from the airport and they all came over and spent the night. Greg and I headed to the hospital. We got there and my contractions began to come sporadically. There was no rhyme or reason to them. After checking me they said that I should walk around for a little while to see if things progressed at all. So, we walked the halls for 2 hours until roughly 4am. At that point, we were both exhausted. When the midwife came back in I had hardly progressed. She smiled and told me I'd done the right thing to come in given that my labors are fast. She said, "Hopefully we'll see you in a couple hours at most!" and we went home. When I woke in the morning (2 hours later) my contractions were gone and the baby was still comfortably resting inside. The thing is, the baby came. It took another week, but she came at the perfect time. She came when my husband was home. She came when my family was able to come over and watch our older kids. She came the same night we were able to spend a relaxing dinner at our neighbor's house. God's timing is always best. I have to relearn this time and again. It doesn't always feel best *in the moment*. If often feels like an imposition. He so often makes me wait when I feel ready to rush ahead. I feel like the little kid in the car asking, "Are we there yet? When are we going to get there?" It's so easy to look forward to the next thing. It's easy to wish our lives away on the upcoming events, the nexts, and the tomorrows. My mantra lately is to quiet my heart. It is to sit still and listen. There is still the temptation to rush forward, to over commit, to get on with all the things, but in slowing down and waiting quietly I'm feeling a lot of peace. Peace about what's to come, but more importantly peace about what's here and now.